Your car, truck or SUV is an important investment, make sure its protected. Whether you keep your car or truck in a garage or outside Auto Barn carries a full assortment of car covers that are either custom made specific to your car, truck or SUV's make and model, by Covercraft or Coverking or universally fits most cars, trucks, or SUV's, imported or domestic by Rain X. The car covers come in a variety of materials and colors to fit any size budget, plus you have the option to add a personalized monogram or graphic if you prefer as well. Own a motorcycle or scooter? We also carry motorcycle covers and scooter covers by Classic Accessories in a variety of colors and sizes to fit most motorcycles or scooters. Click here to read more! Covers to fit a variety of ATV's, UTV's and snowmobiles. If you own a vehicle that you don't take out on the road every day and don't want to keep in the garage, it is important to keep it covered for that time period. 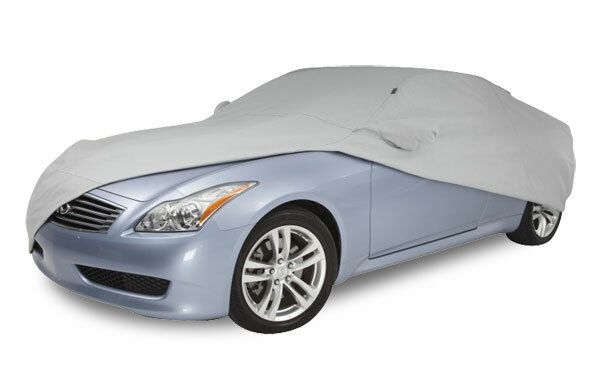 At Auto Barn, we sell a wide selection of car covers from various brands, such as Covercraft, Coverking, and Coverite. These covers are designed to not scratch your vehicle's exterior, while keeping dust, dirt, and precipitation away from it. They also eliminate the damaging effects of ultra-violet rays from the sun.